I do a lot of my quilting on my own sewing machine. I love the way hand quilting looks and I do a few of those but I'm slow so I can't do all my tops by hand. I know many of you send off your tops to be quilted by a long arm person but I really can't afford that..... especially the custom look I like. So, I do my own custom quilting on the machine. But, I really hate having to spend an afternoon clipping all those thread ends on the backside of the quilt. I start my stitching by bringing up the bobbin thread so it's only the bobbin thread at the end that's the problem. And, I always miss a few, it seems. If I have a lot of starts and stops, like on the quilt I'm doing right now, I need to snip the bobbin thread without taking the entire quilt off the machine. That means I have to reach underneath and snip that thread. Using pointy scissors is a problem...... snip-snip and there's a hole in the underneath!! ARRGH!! So I had this bright idea..... I'd use the blunt ended scissors I bought for my GGD before she came for a visit this summer. She's 4 and I didn't want her using any of the pointy scissors I have. And, it is a GREAT solution for my snipping underneath problem...... no little holes..... I just run the thread across the blade and it's ready to pull back up for the next line. Who knew such a simple, cheap tool would work so well for my quilting...... Happy Quilter, here. What a great idea! Thanks so much for taking the time to tell us/show us!!!!! Blunt school scissors has saved me from snipped fabric many times! They are cheap now with all the stores having back to school sales. I keep a pair on the ironing board too. I think the Fiskar school scissors are sturdier and have better blades then the other brands of school scissors. I've been using these little scissors for many years. I had accidently sliced through a completed quilt top while attaching a border to the handstitched quilt. Needless to say I was heartsick. I no longer keep these small pointed scissors near my work. My preschool scissors cost very little and no more accidents while cutting bobbin threads. That's a great idea. I'm going to get a couple of pairs tomorrow! You can also bring up the bobbin thread at the end of your stitching, the same way you do at the beginning, and deal with it from the top. That's what longarmers do. Not just longarmers, I do that too. Makes it much easier to bury the knots and hide the tails when done with the quilting. I don't do the start/stop tiny stitching deal, dont like how it looks. Round nose sewing scissors are all I ever use near quilts, never saw a reason to get pointy ones. Thanks for this tip. It's so good to have more than one brain working on a problem..... and I don't like the way the tiny stitching looks at the beginning and end, either. Didn't know I could do that - will have to give it a try - do you just raise the pressure foot and then put the needle in and back up and the bobbin thread comes up??? I will try that when I got off this board. How do you bring bobbin thread up? Thanks. To bring up bobbin thread, with the presser foot down, let the needle go down into the quilt and back up one time. Grab the needle thread and pull. The bobbin thread will come up. 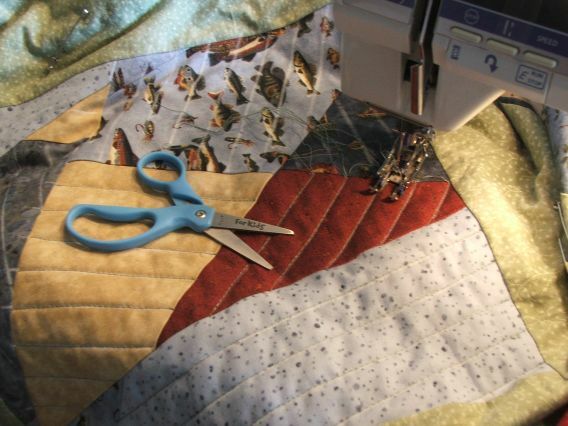 When you are ready to stop, pull the quilt away from your stitching area 3 or 4 inches and take one stitch. Use your automatic thread cutter and then pull the needle thread. It will bring the bobbin thread up again right where you ended your stitching. All of your threads are on top for burying. If you were doing a design that starts and ends in the same place, you can bury all 4 thread at once with a cheater needle. I guess you can see thread burying is not my favorite thing either. I've come up with ways to make it easier. What a great idea, I'll have to look for a pair so I won't accidentally "clip" a hole in my quilts. Thank you for the idea. I love these scissors and use them all the time. They also come in pointed. Staples had them this weekend for $1. for a 2 pack. I use these all the time and love them. They also come in a more blunt design. STAPLES had them this weekend for $1. or a 2 pack. I keep a pair of them with each project that I have "to go", ready to use in the Dr. waiting room, etc. Never have to check to see if all supplies are in project bag. At a dollar a shot, it's worth it to me to keep scissors with each project. Thanks for the suggestion about using the blunt scissors for cutting underneath the quilt. Never thought of that! I'll have to find all those kiddy scissors that my children outgrew. It sounds perfect for sewing threads!! That is GOOD to know!! I try to limit my thread breaks, but started tying off and hiding my threads and I've had lots of unravveling when I do the little stitches. I never tried to get the bobbin back up whuile on the machine, I user the needle to "thread" it to the top... I'll have to play with that tonight. Thanks for the tip. I have a couple of those shears! Have had them for years, usually for paper cutting but can also use for thread snipping and applique.